Does Energia stack up as one of the Arduino alternatives? With all the recent noise around Arduino LLC and Arduino SRL, I felt like I needed a break from Arduino. So I decided to come back to a platform I set aside a while ago: TI’s MSP430. In this post, I’m looking at an open source IDE that’s available called Energia. 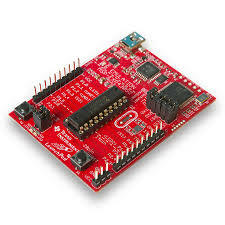 It makes using the MSP430 series boards a snap. And, by the way, makes for a great Arduino alternative. The MSP430 is a very capable processor. The G2x series feature lower power consumption than an AVR, while also being 16-bit. And if you remember the video game wars in the 90s, 16-bit is way better than 8-bit. The RAM is a bit smaller than an Uno: only 256 or 512 bytes depending on the chip. My board runs at 1MHz, but 16MHz boards are available. In addition to the 16-bit boards, there are 32-bit boards available as well–also supported by Energia. There is a multichannel ADC and a handful of GPIO pins. On the LaunchPad board there are 2 (not just 1!) programmable LEDs and 1 programmable button. These additions are nice and something I wish Arduino boards would include. Depending on the board, it may or may not come with pin headers attached. I prefer it to come without. It means an extra step of soldering, but makes using the board more flexible. Do you want headers? No problem. Going to solder the wires directly to the board? Uh, okay, sure. You can… but why? This year, I visited the TI booth at CES in Las Vegas. To my surprise, Energia’s name was all over the place. Clearly, TI had embraced this project and not squashed it. Energia was initially developed by Robert Wessel with the intention of bringing the simplicity of the Arduino platform to the MSP430. And I have to say, it has been successful. The IDE is based on Wiring, so it looks and operates much like the Arduino IDE. 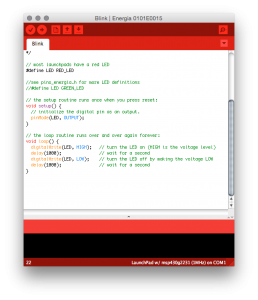 There are plenty of ready-to-compile examples built-in, so learning about the MSP430 is no problem. Code is written in C/C++ with a library of functions on top of it. Just like Arduino, the code is compiled with a family-specific version of GCC. Familiar Arduino functions like digitalWrite(), pinMode(), and delay() will all work. In fact, you can recompile most “Arduino Code” sketches for the MSP430. Just watch the RAM! Oh and the best part? It is Cross Platform: Windows, Linux, and Mac! The Arduino team worked very hard to support driverless installation for their boards. Even on Windows, you aren’t installing a driver—just an information file. This low barrier to entry is very popular with non-technical makers. Unfortunately the USB to Serial chips on the LaunchPads do need drivers to be installed. And much to my annoyance, the OS X installer requires a reboot. (It shouldn’t.) Not painful, but not as seamless as Arduino. But is it really an Arduino Alternative? Yes. Now keep in mind that the serial driver and the soldering of pin headers adds a little complexity. The time from opening the box until you blink a LED is slightly longer compared to an Arduino. However, if you’re a technically minded person, the MSP430 with Energia is pretty easy to get up and running. With how easy Energia makes using the MSP430s, there’s no excuses to not learn more about them. 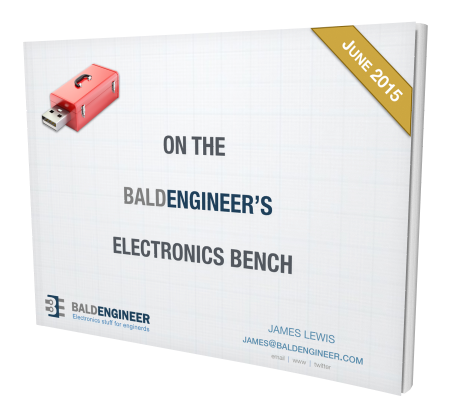 Question: Have you used a MSP430 or MSP430-based board in a project? If so, what did you think? You can leave a comment by clicking here. The LaunchPad MSP430G2 is only one member of the extensive family of LaunchPad supported by Energia. My favourites are the LaunchPad TM4C with a Cortex-M4F, the LaunchPad CC3200 with Cortex-M4 and integrated WiFi perfect for IoT, and the latest addition, the MSP432 with Energia MT = multi-tasking based on TI-RTOS = the RTOS power with the Wiring / Arduino ease of use. I worked with my friend Martin Valencia to run an MQTT example on energia and CC3200 (https://youtu.be/58-Lp38pmnY) – he useda LaunchPad, I used a Yún and we both used Eclipse PaHo as testbed. And he also made a Temboo integration using energia to send LaunchPad emails from GMail (https://youtu.be/spGMCunyewA).